From 1990: The (thin) paperback book WELCOME TO TWIN PEAKS. One of the victims of the general crash in all-things-print seems to be the "unofficial" tie-in. Once upon a time, any TV show that looked half-way like a hit would quickly be accompanied by a hastily-written tie-in peppered with disclaimers and a smattering of magazine covers or agency-purchased stills of the stars. The internet, briefly, made these books easier to write as it supplied a ready research-from-home source for authors in a hurry. But, at the same time, it was also killing the market. The book shelves used to be straining with unofficial STAR TREK tie-ins... now you will be hard-pushed to find anything of the sort... and I doubt very much that's down to the ace legal team of CBS Consumer Products. The truth is... no one cares very much anymore. I think one of the most damming comments on ENTERPRISE is, despite a four-year run on a national (albeit cobbled together) network, no-one could be bothered to write a book (except for some novels) about it. 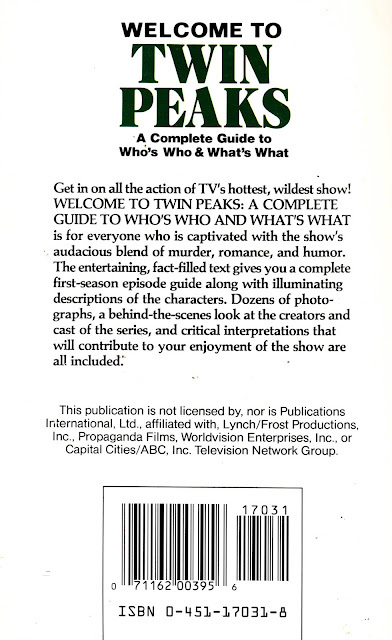 This is a quickie release from 1990 that appeared between the two seasons of PEAKS... that brief moment when the show looked like it might be hot for a while. Apparently, this sleight tome attracted the legal ire of the network and production company and had to be withdrawn and pulped. I picked this up at the time from the Fantasy Inn bookshop on London's Charing Cross Road (just around the gallery from Trafalgar Square) before it burnt down and closed for good. one book that's definitely on the cards is a novel written by mark frost. Apparently this will fill in the details of what happened between the original series and the new one. Kind of like what the star wars comics / books will do for the period between return of the jedi and the force awakens. Its true that there used to be a surfeit of trek books in the shops and I have boxfuls of them in my garage to prove it. Not only was there no companion book to ENTERPRISE but even starlog passed on doing a licensed mag. Most likely they sensed that tv trek was nearing the end of its natural life and decided not to go down with a sinking ship. The new trek movie is called STAR TREK BEYOND but I'm not sure how much longevity trek has as a movie franchise. Who knows, maybe another spin off tv show will ahem...materialise. in the future....? - I don't think there has ever been an episode guide book devoted to the show (although there is a really good one that covers the whole Trek lore... including Enterprise). - It was the only series not to get a "Companion" book from Pocket Books. - There was no Technical Manual (mind you... I'm not sure Voyager had one either). - The CAPTAIN'S LOGS series of unofficial companions had long-since died a death. I think they reprinted material originally prepared for CINEFANTASTIQUE magazine. 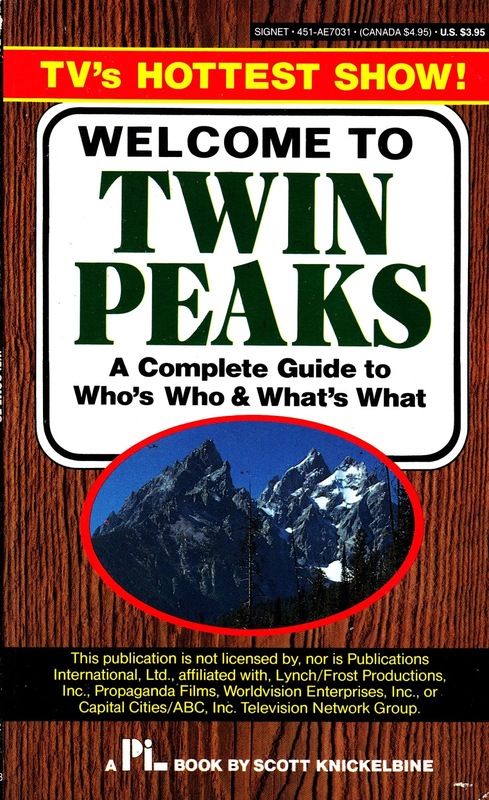 - The NITPICKERS GUIDE books had died several series earlier. - No one has ever published an ENTERPRISE comic book... either as a one-shot or an ongoing series. That's all pretty dire for a branch of a once mighty entertainment franchise that, a few years earlier, could command copious numbers of books and tie-ins. I'm not sure that TREK could return to traditional TV... I'm not sure the demand is there or whether the economics would add-up. BUT, I think it would be a no-brainer for a premium download service as it would surely deliver a small, but willing-to-spend, audience who would have no hesitation in buying a new series outright. even deep space nine got more media coverage and that too was regarded as an unloved ' third child '. It was just bad timing for ENTERPRISE , instead of riding on the wave of merchandise, it came in on the tail end of it. Yes perhaps Netflix or some such service will fund a future trek series.